When choosing a cutting width, we recommend you choose a blade equal to the size of your hedges. Measure the depth and width of your hedges and choose a blade equal to or greater than the smallest of the two. This will enable you to make smooth sweeps across the tops of your hedges without missing any spots, making the tops of your hedges smooth and level. Be careful, however, not to get a blade that's too large. The larger the blade, the heavier the unit will be. It's always best to keep your hedge trimmer as light as possible to improve handling and avoid fatigue. 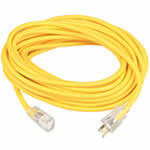 When it comes to extension cords, size matters. For outdoor power equipment, you do not want to use a lightweight extension cord like those used for light fixtures inside the home. The gauge size of the cord measures the thickness of the wire, which is the determining factor in how high of a current capacity it has. The lower the gauge number, the higher the cord's current capacity. For hedge trimmers, it's recommended that you use a 13-14 gauge outdoor extension cord. Also, be sure to choose a length that will reach where you need to go. 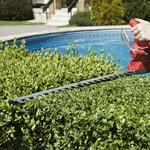 An adjustable handle can make trimming your hedges much quicker and easier while also improving precision. There are not many corded electric hedge trimmers that offer this option, but it's a worthwhile feature to have. 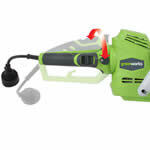 Corded Electric Hedge Trimmer Buyer's Guide - Find out How to Pick the Perfect Corded Electric Hedge Trimmer. Our string trimmer how-to library can help you pick the perfect electric string trimmer, gas string trimmer, walk behind string trimmer or brush cutter.